I was hoping for a white Christmas this year, but no snow to be seen here... It's raining and windy and it's about 10 degrees Celsius outside. I just have to get through a very quit day at work today and than I'm off for a good week and a half. I can't wait! 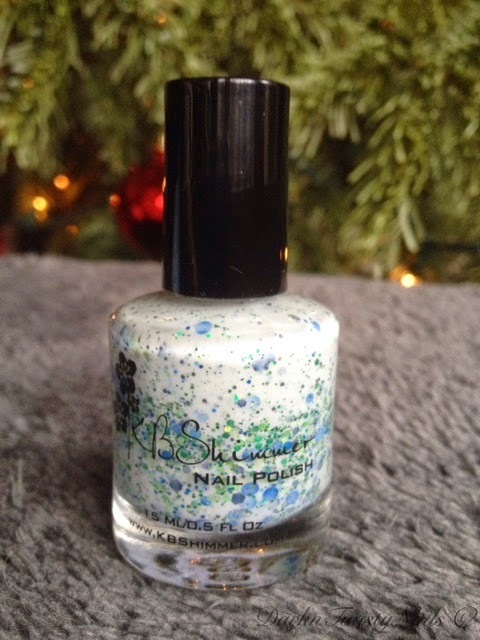 Today I have another gorgeous Christmas themed polish for you, but this is a little more subtle. 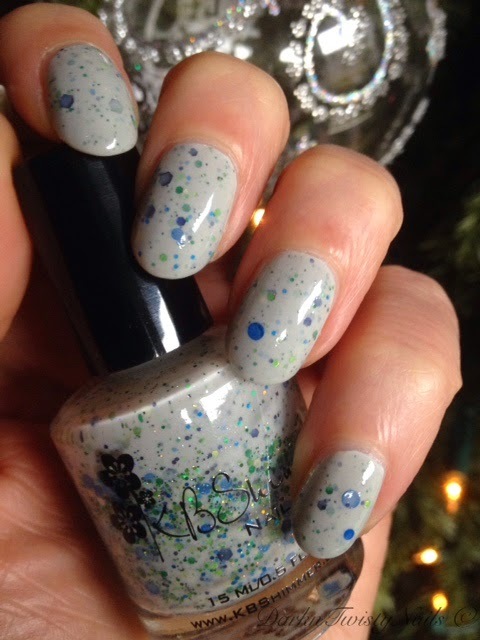 KBShimmer Let's sleigh together is a light grey crelly base, filled with hex glitters in green, navy and pale mint, blue circles and a stunning micro holographic shimmer that makes this polish pop on the nail. The formula is excellent! I was expecting to have to do some fishing for the larger circle glitter, but they came out easily and I didn't have to do any dabbing, just a normal 3 strokes and you're done. It's opaque on its own in about 3 coats, but I layered it over just a single coat of China Glaze New Birth, a slightly blue tinted white. I love how this looks on the nail. It's such a calm and relaxing polish, but you still get a pop of glitter. This polish really goes with everything and in my book, it's the perfect polish if you want a bit of sparkle, but can't get away (or don't like) the over the top glitters. I've worn this polish for a week straight, without chipping or even tipwear. This doesn't happen normally, because I'd just get bored with it, but not this polish. I still love it as much as on day 1 and I'm going to be a little sad when I take it off tonight, but I want to wear a different mani for Christmas. 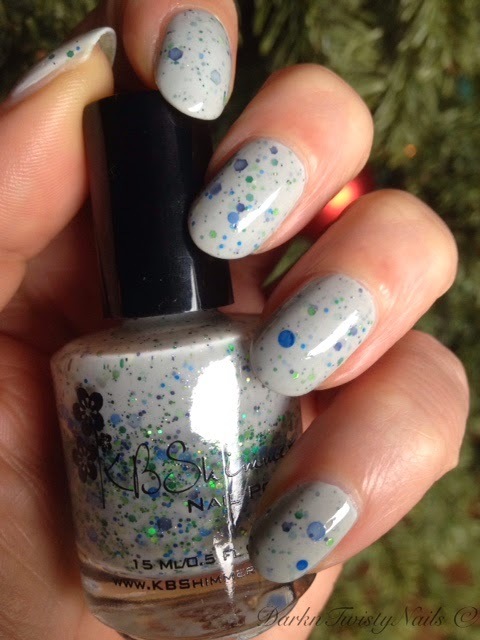 Have a great Christmas eve and have you decided yet what polish to wear for Christmas yet? Wat een beauty! Erg leuk! KBShimmer Run! It's the coppers!